Is it even possible that hope could spring from despair? In the kingdom of God, it’s not only possible, it’s inevitable. The story of Israel had been an expansive success, yet at the time Isaiah wrote, all of that had been chopped down. All that was left was the stump of King David’s long-forgotten father, Jesse. As many people know, if you want to stop a tree from growing, you can’t stop at the stump. The stump and roots have to be ground out because otherwise the stump will very likely sprout several new shoots. In forestry this is done intentionally in a practice called coppicing. 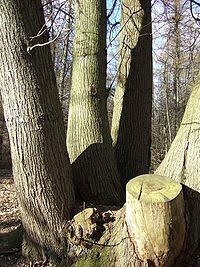 A coppice is a growth of small trees coming from former stumps. I learned this by experience a couple of years ago. There was a wooded lot nearby that someone worked very hard to clear, but they left the stumps. By the next year each stump had sprooted multiple branches. It appeared to me this may have been a surprise to the owner, unless what was in mind was a new tree-growing business. How would our loving Heavenly Father have us look at the stumps in our own lives? Maybe it’s the venture that went under, the marriage that failed, or even the loss of a dearly loved child. There is loss – profound loss, yes. Yet is this the end of the story? Or does the very nature of things tell us that new life will inevitably spring forth where roots run deep into the loving faithfulness of our Heavenly Father? From the stump of Jesse sprang forth both a Savior and his church. What might already be springing forth from the stump of you? This entry was posted in Religion on November 28, 2010 by Steve Godfrey.